None of the flaking was synchronized with the sound. I call fake! I listened to it again and it seem that it’s in a big hall or something like that and there is a delay in the sound from the speakers. Which woman are you in the video? it is in a large enough theatre, so yes – the sound has a bit of traveling to do. Why would you fake that? Just why? Most probably the “drum” effect is given from the internal switch full ON and/or OFF noise of the various diodes. The steep variation of the current required to lit from one LED to another or maybe to 3 of them, will provide an audio pulse since current step in DC is filtered away from the coupling AC capacitor on audio inputs, providing only the delta (the pulses) transalted in sound in correspondence of such current steps. The out-of-sync effect is because you expect the pulses to be in a different moment rather then they actually are. Do that to one of the “candle” LED’s you will hear twinkle twinkle little start, greensleeves, happy birthday, etc… It’s a very common thing for china manufacturers to use music chips to create a random flickering led. This is the most interesting bit of trivia I’ve heard in weeks. I suspected as much, thanks for the link. Saw one of those cheap dollar store types and I could swear that it was powered by ‘Jingle Bells’. And not subtly either! It flickered Like morse code. Probably just a low button cell. I dread the next two decades of this being sampled into various music genres. Was just thinking it’d be nice to be able to buy music in LED form, little 2-pin socket thing for the player, and you buy an LED with the music stored on it, encoded as MP3 or whatever. I do like the “thumping” sounds. Reminds me of Alva Noto. 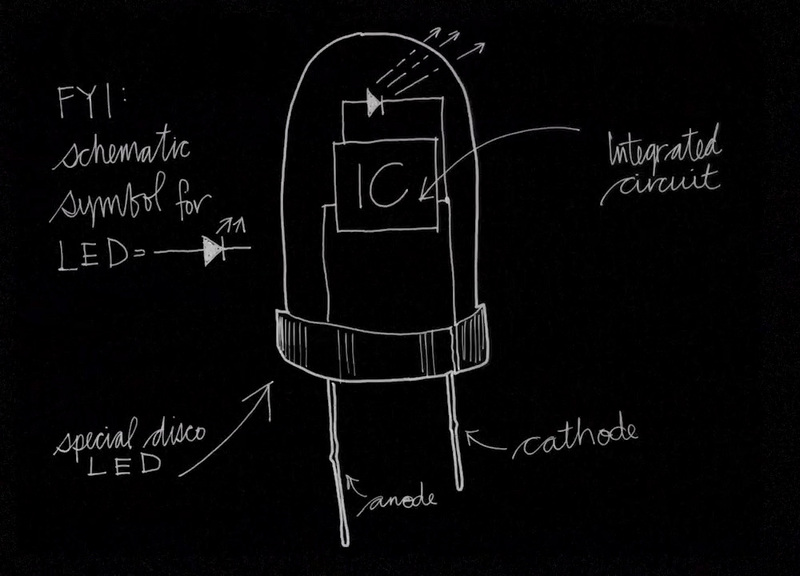 More art than actual function…but why introduce a little art into Hackaday. Specially about how to draw a beautiful Schematic. Seen over the years shematics from he*l. So ugly and text over lines and symbols. Text in different directions. Really like a 5 year old try doing a schematic. 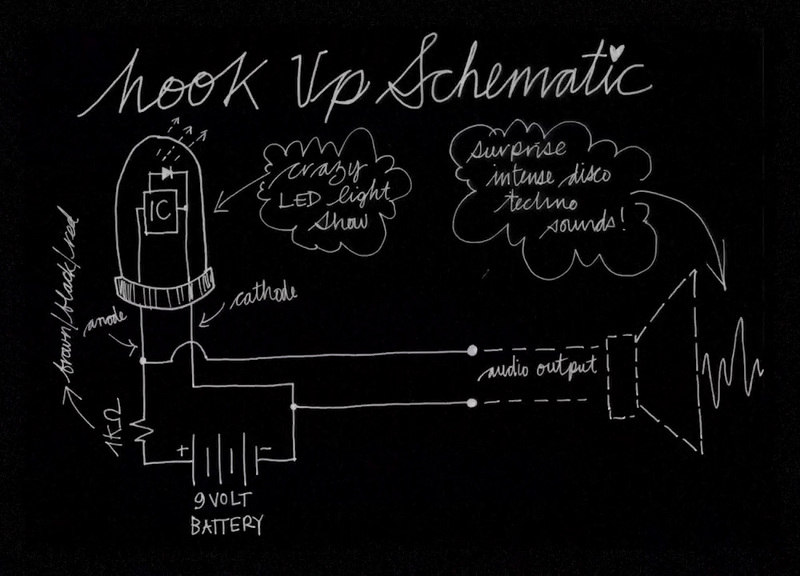 More art than actual function…but why NOT introduce a little art into Hackaday. Cool! Did a similar thing a few years back. My LEDs make sounds like WW2 planes flying by. If you connect the battery backwards, it says “Paul is Dead”. Or possibly it lets out the magic smoke. Either way is still fun. Hide a secret message in a music chip tea candle. Is there a music note cipher? This could make a great Defcon puzzle. Hook the audio output to an FM transmitter and you have a pretty sweet beacon noise. The combination of shrill whistles and pulses would be very easy to pick up over RF noise.